This makes a wonderful supper dish – it’s sort of half salad and half pizza! It is my favourite kind of meal, because it’s all about contrasts: there’s the hot crunch of the pizza base and cold smooth slices of tuna; there’s the rich creaminess of the onions and the saltiness of the olives and anchovies; and then there’s the sharp pepperiness of the cress leaves and the lemony tartness of the vinaigrette. ✱ Heat the duck fat in a medium-sized saucepan over a moderate heat. Add the remaining ingredients and cook for 60-90 minutes, stirring regularly to ensure the onions don’t catch and burn. ✱ Spread the onions onto 500g of pizza-like bread flour dough in a thick layer. Arrange 50g of anchovies across the surface to form a diamond pattern and stud each diamond with a black olive. Drizzle with olive oil and bake for 20 minutes at 180°C until the base is crisp and golden brown. ✱ Preheat your oven to 180°C. Warm the pissaladière in the oven for 5–10 minutes while you prepare the other ingredients. ✱ Place the tuna slices in a shallow bowl, season with salt and pepper and pour on the lemon vinaigrette. Place in the refrigerator for a few minutes to marinate. Toss the cresses together in a large mixing bowl. 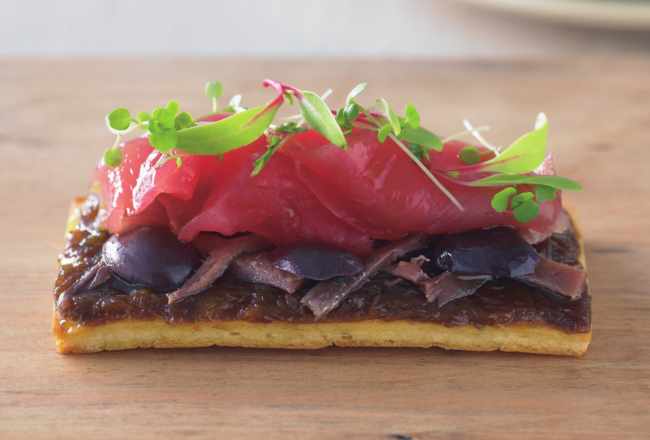 ✱ To serve, cut the pissaladière into quarters and arrange on serving plates. Top with slices of the soused tuna and a mound of the baby cresses. Drizzle with a little extra-virgin olive oil and serve straight away.